But the simple answer as to whether you should trade them or not, really comes down to trying them and seeing what feels right for you. If you need to stand aside for the first 10 or so minutes to let the market show it's bias, then by all means do so. There are some clues that can alert you to a potential bias. For example the pre-session trend (if the market offers 24 hour action), or the location of price reference the prior day's session (is it gapping open!!!). Of course, the open can completely change the sentiment in the market. The most useful tool I have for establishing a quick bias beyond the open is via the use of Opening Range Theory. Google it if you're not familiar. You'll also find a few articles on my site and my prior blog. Typically the OR is based on the first five minute candle's high and low price. But the same concept can be applied at smaller timeframes. For example, the opening 1-min candle can provide a temporary OR bias well before the close of the first five minute bar. Price above the 1-min OR is bullish bias, price below is bearish. Watch for false breaks though! Sometimes you'll get trapped. Really the key is in learning to feel the sentiment as price breaks these key levels… 1 min OR bar high or low… 5 min OR high or low… or swing highs or lows. Is it accepting these areas, or is it stalling and rejecting them? I'll copy the image below. 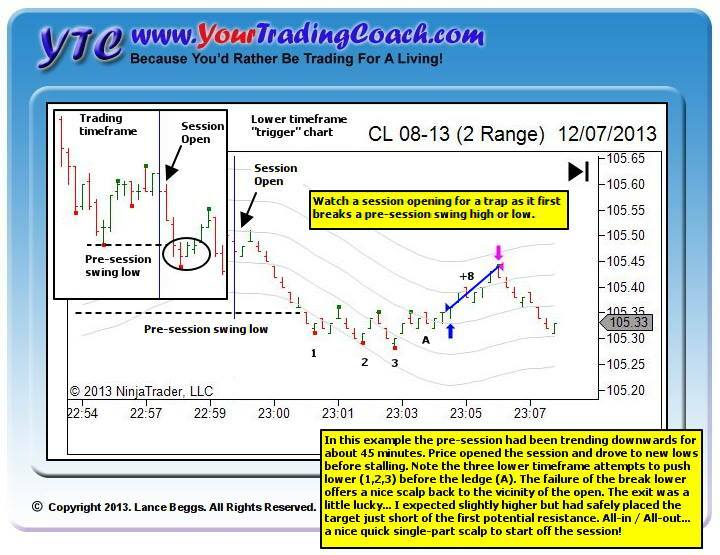 The trading timeframe chart in this example was the 1-min chart. Note how it broke the 1-min opening bar low, and then the pre-session swing low, but then stalled and showed no selling pressure at all. This offered a scalp back up to the vicinity of the open. These trades are much more difficult, because the bias is not really clear yet. So trial them on a sim first. If you're not comfortable with them yet, stand aside for that first 5-10 mins. It's something you can re-explore again in future.